interminable on the surface of a far distant star. Editor’s Notes: DG Canum Venaticorum (DG CVn), a binary consisting of two red dwarf stars shown here in an artist’s rendering, unleashed a series of powerful flares seen by NASA’s Swift. At its peak, the initial flare was brighter in X-rays than the combined light from both stars at all wavelengths under typical conditions. September 30, 2014, image by NASA’s Goddard Space Flight Center/S. Wiessinger. 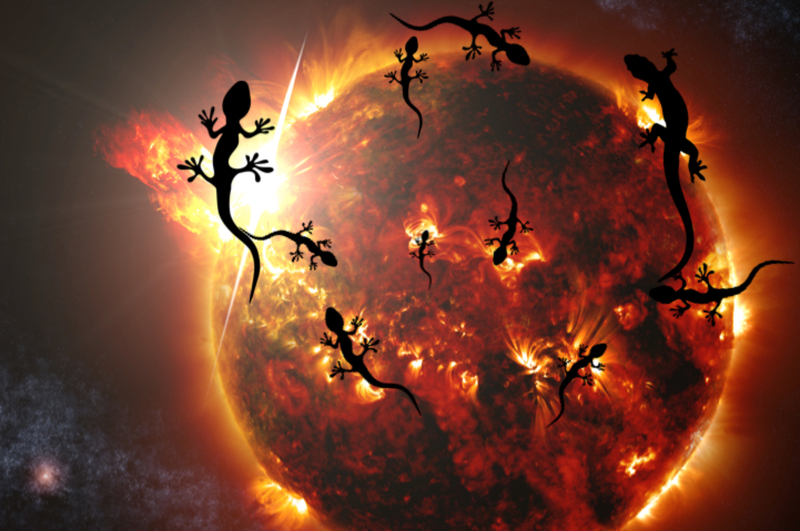 The image is surrealistically enhanced is with superimposed salamanders.